All Ages, Early Show, Local Organic Harvest Dinner........ Flyer coming soon, but wanted to get the word out now! Nice Haile Bless! Looks like an awesome night you have set up there! Ras Iba? Is he from the VI?? Love Toussaint and Tuffy! Yes rossta, Iba is a VI artist. I think I may have suggested his works to you on one of the previous threads but cannot remember. He has 3 albums out as well as a few tracks on Talking Roots and Gather The Remnant compilations. Bambu Station handled the production for his first 2 albums and I believe Tuff Lion worked on his third. ive been listening to them rehearse a bunch at my friends dem sounding nice !!!!! @rossta-- if you are a fan of VI reggae and have not heard Iba's "Mathaysel" album you should definitely check it out! Top notch! BIG BIG ARTIST, well worth the trip alone to Beautiful Bolinas. JPS, you were the first to mention him to me. I have purchased a lot of VI reggae in the recent months Abja, Army, Yahadanai, Ras Attitude, Ras Batch, a few compilations, Nada Mile, The Pixes, but Iba is one I have not checked out. WIll probably be my next purchase. Thank you ReggaeB for the recomendation. I will be checking it out for sure! Bless up Haile Conscious for the videos and the great promoting of this wonderful show. Wish I lived in NOR Cal still for this show. A few extra special guests in this one! Wonder who will be there this year? 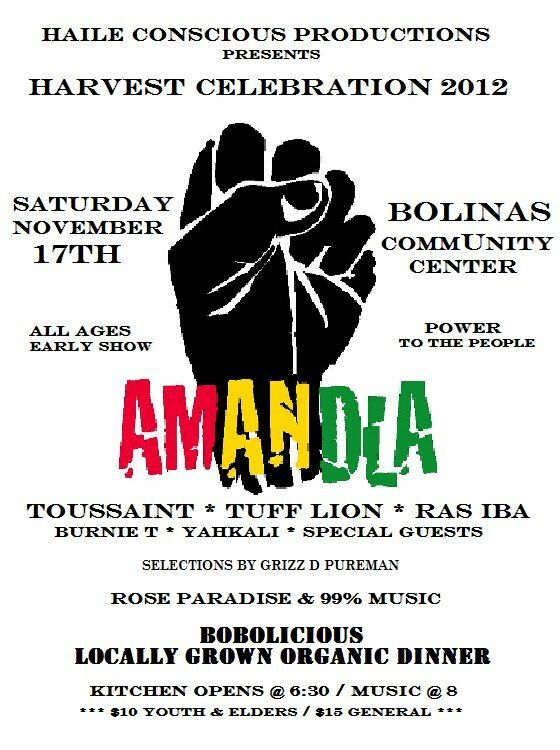 (You know how we do it in Bolinas) Amandla holdin it down for a truly grand finale! Thank you for sharing Haile Bless! Rossta, see di itunes link above for Toussaint's newest album, get it! I forgot say before that Mikey General pon it too! Also his album Black Gold (on I Grade) is massive - great rootsy singer, fulla soul and a little funk too! Yes, Black Gold still gets lots of play....great album. There is a very high chance that when I get in her car that album is playing. Been meaning to pick up his newest one as well. Would love to catch him live someday. Sounds good I will check it out! Neither Haile Bless nor JPS has let me down on albums recomended before! I love everything you two have recomended in the past! THank you ! This video is from Toussaints first appearence in Cali, when his Black Gold album came out. I was well impressed and an instant fan, I found Toussaint to be a humble breddrin and full joyed seeing him interact with the crowd after his performance, autographing his album and greeting fans... I def recommend catching this brother if you can! Edited 1 time(s). Last edit at 11/14/2012 04:55PM by Christopher. Thank you Christopher!! I am at work right now and cant watch videos but will as soon as i take a lunch break! I am down for some VI trivia of who is on stage!! THanks Christopher! Kinda hard to see... but if you watch till the end you'll get a little help! Enjoy. "Ras Iba is amazing, really been enjoying his music. Amazing stuff!" I knew you would dig him Rossta! No problem rossta. I'm glad that you are enjoying those albums. It's always nice to be able to share new music with someone. And when I said get in her car, I was meaining my wife's car. She is a huge Toussaint fan and Black Gold gets A LOT of play. Thats awesome JPS and I knew what you meant. Do you like that Nazarene's album Meditation ? Ive been loving that album. I still love Midnite more than any other VI reggae ive found but cannot believe that for so many years I didnt even listen to other artists. Some really amazing artists out there that are either from the VI or working with VI producers. I am ordering Black and Gold today along with a Ras Iba album Matsahyel. Does anyone have a review on that Tuff Lion album 10 strings? Also I really want Sabbatical Ahdah Heart of Joy. Cannot find a copy anywhere. If anyone knows where I can purchase a copy please fill me in. Last but not least also want to check out some Inner Vision, Frontline or Street corner muscian? WHich is a better album to start with?? Bless Oh, Also Haile Bless I need to link up with you about Kulcha Knox new works. Would like to pick that up also! Love that Reggae Music!!!!! 10 strings is an amazing album. You will recognize most of the riddims as they are all from I Grade albums. It's all instrumental. Here's a quick preview along with a review from Achis. As far as Inner Visions goes, my favorite album is probably Stay Alive but Street Corner Musicians is very good. They do have a different sound from some of the other VI acts, as Grasshopper has said before. Another one of my favorites is the Finally Captured Live album. There are only 6 tracks but 2 of them are medley's and run almost 30 mins each. You should be able to buy and listen to all of them at CD Baby. And yes, the Meditations album is massive. I can't get enough of the album. Thanks JPS. CD Baby huh? Never heard of it. I normally get my albums from VIRoots.com or the artist page themselves. Will check out CD baby. Yeah I have heard some of Inner Visions music before and does have a different sound than most VI artists but nothing wrong with that. I will check out the albums you mentioned. Thank you again! I don't believe VIRoots has all of their albums or else I would definitely had suggested them. I'm sure you know by now at the rate you order from them they are quick and reliable. Never actually ordered from CD Baby but they are out in your area, Portland, so shipping shouldn't take too long. And the more that I listen to my Inner Visions albums the more I enjoy them. CD Baby, they dont seem to sell hard copies just MP3 tracks. I like to purchase hard copies. I am probably one of the few who buys CDs and records only. Yeah, they may only have have mp3 of certain albums. They should have physical copies of the Inner Visions album. I'm with you. Only buy mp3 if I absolutely have to. Love having the actual product. Just found on Ernie bs that they have a Nazarene's album from 05 entitled Songs of Life. Might have to check it out. Nice to hear Daniel! Thanks for adding that. I noticed it was produced by CRS/Heartbeat Europe. When i clicked on CRS Heartbeat Europe another Nazarenes album came up Rock Firm from 2008. Although Ernie bs has Nazarene's Rock firm spelled funny so it didnt come up under my search the first time. Have you listened to that album Daniel?? I have not gotten any work done today. LOL Ive been searching for new music. haha. Seems like a half day to me. I dont buy mp3 either, and love to check out all the liner and info on my cds. Not sure why there was never a hard copy of Where I Lead, gonna have to ask Toussaint bout that! Yes Reggabe thank you for the suggestion of Ras Iba. JPS had also suggested him to me. I have not purchased any of his albums just been listening to his works on Daniels VIreggae website. I cant seem to purchase matsahyel though. Sold out everywhere. Must be legit!!! What are the chances Messenjah Selah will be one of the special guests? By the way, I met your brother here in the AAA office (at least he said he is your brother) I'm hoping to make the trek out to Bobo-town for this show. You coming out Carl? If so, see you there. rossta, check this link. Should be able to get a physical copy here. Ya I'll be there for sure. Hey Mr Black, there is a good chance Selah will be one of them, he often is, but no promises... Also a chance of I-Taweh being there, but not confirmed, others too...... jus gonna have to come and see who!?! JPS you are the man! Dont know how I missed that on CDbaby. Thanks much! just purchased it. Now on the hunt for Heart ah Joy by Sabbatical. hope to be there, love reggae in bolinas,always a great show love tuff lion and the rest. Here is the link (I hope, if not Daniel or someone help please) for tomorrow nights menu. 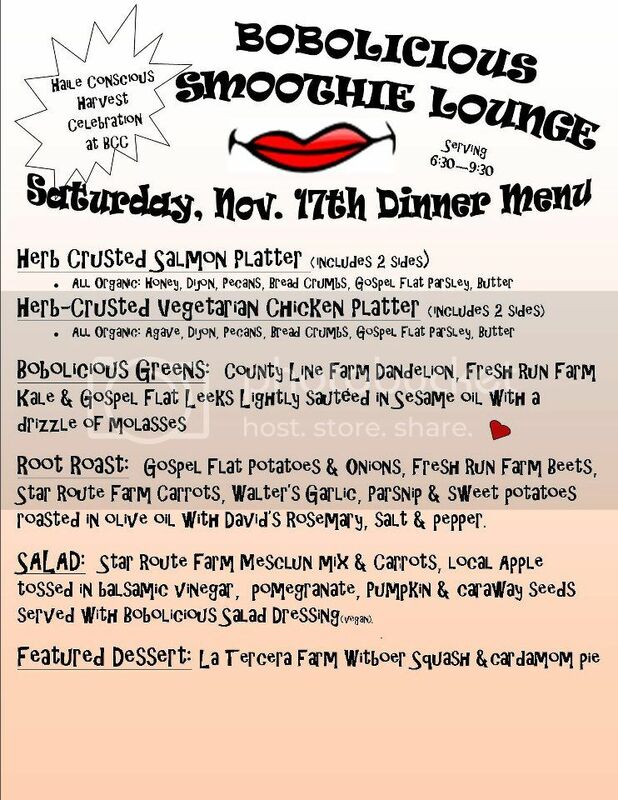 Almost all from our Local Organic farms and the Bolinas Bay.. Harvest Celebration for real - Give thanks! Hopefully you will be getting some nice footage of this one Nomo? Always a fan of your videos. Well the food was amazing. The music was soothing and sweet, and always great to hang with my reggae family. Thanks Maitreya, i'll have that video of 99% up today. Met Toussaint before the show, good times. Man, I tried to reach the show as I was coming down from Tahoe, but bailed and headed back down to Santa Cruz when I was nearly forced off the road by the driving rain and howling winds on the coast. Wild, wild weather. Sorry I missed this one. But safety must be first. And I knew Nomo would be there, capturing the essence. I also didn't make the trip out due to the weather, maybe next time. I may be crazy, but i never let weather cancel a concert. A few years ago i drove to Santa Rosa to see Chinna and KIddus I, took me 2 1/2 hours to go the 50 miles in a huge rainstorm. Right after the show ended, i turned around and there was a young local guy, his mouth open and a huge grin on his face, couldn't believe his fortune at seeing such a great show in such an out of the way spot. I assured him it was Maitreya's doing, he didn't know who that was but was immensely thankful. Give thanks to all who came despite di rain! Food was super good, some of the best salmon ever, and the winter squash pie was divine. The music was wonderful, what a joy to see how these already fine artists have grown into such a harmonious and powerful collective AMANDLA for real! I forgot to say a special thanks to Carl aka Nomo, for once again filming the show! I am so thankful every time you come, just wish you had discover your love of my shows sooner, cause some really great ones have come and gone without any documentation!